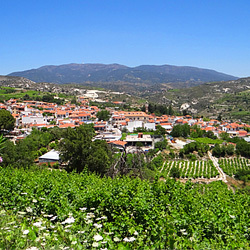 Panagia is a mountainous picturesque village in Cyprus, located at an altitude of 900m in the Paphos mountain range, at the outskirts of Paphos forest and just 35 minutes from Paphos International Airport. Archbishop Makarios III, the first president of the Republic of Cyprus, was born in Panagia. 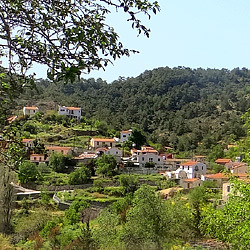 Panagia owes its name to the many churches and monasteries, which are in the village or close to it and which are dedicated to our Blessed Virgin Mary. 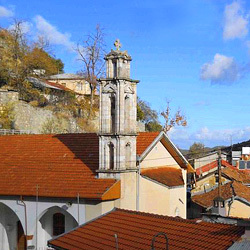 In the centre of the village there is the ancient church of Panagia Eleousa. 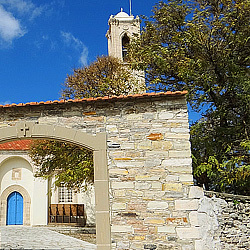 One mile east of the village is the chapel of Panagia of Sarkas. Half a mile beyond that was another chapel of Panagia of Karyon. 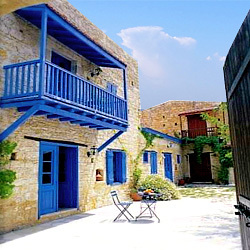 One and a half miles southwest of the village is the famous and picturesque monastery of Panagia Chrysorroyiatissa. 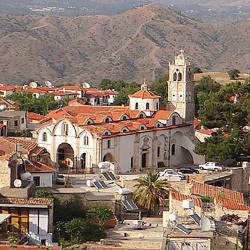 Fifteen miles east of the village, through the dense forest of Paphos, is the historic and famous Byzantine Monastery of Panagia of Kykkos. 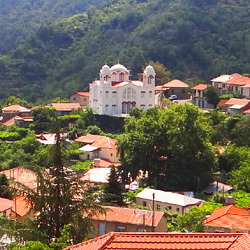 So the village of Panagia village is among five churches dedicated to Saint Mary, from which the village took the name. 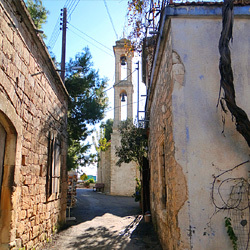 Many times we can find it by the name "Pano Panagia", as it’s one of the tallest areas of the Paphos district. 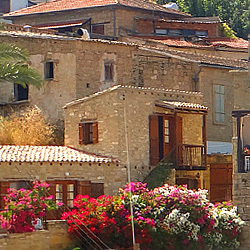 One tradition says that the village was just below its current position, at the location "Pelekaniaka". The few inhabitants, shepherds then, woodcutters and lumberjacks, were cutting wood from the nearby forest which they used in woodcraft, and manufacturing vessels for kneading bread, and other tools. It is called "Pelekaniaka" because almost all the inhabitants of the village cut wood and produced various household items which they then sold. Bad luck struck however one dreadful night. 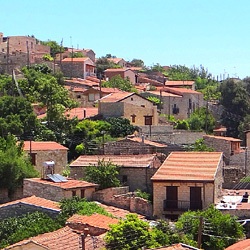 A terrible earthquake completely destroyed the beautiful village of Pelekaniaka. Today there is a towering cliff, called “the cliff of koukos”, south of the village, and it said that it was directly linked to the destruction of Pelekaniaka. Many years ago, as tradition says, a large part of the cliff tore away due to a strong earthquake and covered the village. A bird says the tradition, wept and warned residents to leave, saying: Pelekaniates you must go because the cliff cracked and it will collapse to swallow you and you will go to Ades. 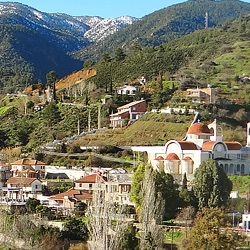 Today the village is known for its unique wildlife, amongst which is the Mouflon, species which is protected by Cyprus and International laws because it is an endangered species. 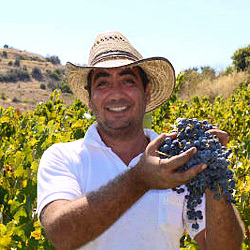 It is also known for the viticultural zone Vouni Panagias, which is considered by the wine connoisseurs’ in Cyprus as one of the best on the whole island. 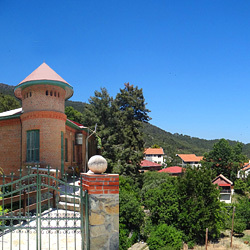 The historical Chrysoroyiatissa Monastery is nearby. 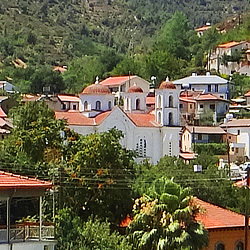 Finally Panagia has a total population of 580.